PTEN, Cyclin D1, Pituitary tumor, Proliferation, Cell cycle-related proteins. Pituitary tumor, as one of the most common malignant tumors of endocrine system , has a very high mortality rate . At present, surgery and chemotherapy are main treatment for pituitary adenoma . Although more than 80% of the patients have benefited from first-line chemotherapy, serious problems like high recurrence rate and low survival rate remain to be solved . The study found that the occurrence and development of pituitary adenoma is a complex process of various factors interaction and is highly correlated with multigene family abnormity [5-8]. This suggests that the determination of molecular targets will be a research topic and it will help to understand the development process of pituitary adenoma. As a kind of newly discovered tumor suppressor genes, PTEN belongs to the gene family of protein tyrosine phosphatases. Cyclin D1 is the protein encoded by human CCND1 gene. As a kind of traditional proto-oncogenes, excessive expression of Cyclin D1 would leave cell proliferation out of control. However, Cyclin D1’s mechanism of action remains different in development process of different malignant tumors. For example, it resists apoptotic and promote proliferation in ovarian and large B cell lymphoma  while inhibits tumor cell proliferation in renal cell carcinoma and esophageal cancer . This study aims to analyse the expression of PTEN and Cyclin D1 in pituitary tumor, the mechanism of action of pituitary adenoma and its relationship with the occurrence of pituitary adenoma. Human being’s pituitary tumor cell line GH3 is purchased from ATCC Company, preserved in the laboratory. MTT is purchased from Sigma; DEME culture medium from GIBCO; CIAPINI mouse anti-human monoclonal antibody from Gene Technology co., LTD, Shanghai, China; Olympus BX51 microscope from OLYMPUS, Japan; and fully automatic protein visualizer from Bio-Rad, America. After GH3 trypsin digestion with good cell growth condition, a single cell suspension of high glucose and with 10% fetal bovine serum for preparation is seeded in 24-well to the density of 80%; rinse bovine serum albumin of higher serum glucose DMEM twice; prepare the liposomes/DNA complexes: to 50 μL Opti-MEM respectively add antisense vector plasmid-pGPU6/ GFP/Neo PTEN/Cyclin D1 siRNA, the negative control group plasmid-pGPU6/GFP/Neo-scramble-siRNA and positive control plasmid-pGPU6/GFP/Neo-GAPDH with the weight of 0.8 μg for each, continue to add 1.5 μl LipofectamineTM2000 liposome and place it at the room temperature for 5 minutes. Classify the transfection cells respectively as experimental group that is PTEN/Cyclin D1 siRNA, PTEN/Cyclin D1siRNA1 and PTEN/Cyclin D1 siRNA2, negative control-siRNA- Con-siRNA and positive control group-GAPDH. Human pituitary adenoma cell GH3 remains a single cell suspension in logarithmic phase digestive centrifugal suspension. Vaccinate 5 × 103 cells/well to 96-well plate. Put it in incubator with 5% CO2 at the temperature of 37°C for overnight. Next day, to draw the culture medium in the holes and add 200μL serum free medium with the infection of certain adenovirus. After continuing a routine culture for 72 h, add 20 μL MTT (5 mg/mL) to every hole and continue the routine culture for 4 h, then blot supernatant and add 150 μL DMSO solution, avoid light and shock for 10 minutes. Detect absorbance value in microplate reader. Human pituitary adenoma cell GH3 remains a single cell suspension in logarithmic phase digestive centrifugal suspension. Vaccinate 1 × 103 cells/holes to orifice plate of 6- well. Put it in incubator with 5% CO2 at the temperature of 37°C for the night. Perform medium exchange once every three days. Blot the culture medium in the holes and dye the solution with crystal violet for 5 min after 15 min of 4% paraformaldehyde fixation of cells. Photograph with the digital camera and quantify cell cloning with the adoption of quantity one. Make the statistical analysis of data through IBM SPSS 17.0 software with the test of measurement data marked by mean ± standard deviation and counting data χ2. Mean comparison among groups uses “t” test, conduct correlation analysis by means of the Spearman rank sum and perform multiple factors analysis with the method of logistic regression. P<0.05 represents the difference is statistically significant. PTEN/Cyclin D1 with siRNA expression can inhibit the proliferation of pituitary tumor cells and proliferative ability of siRNA cells in vitro significantly decrease after the transfection into antisense vector. 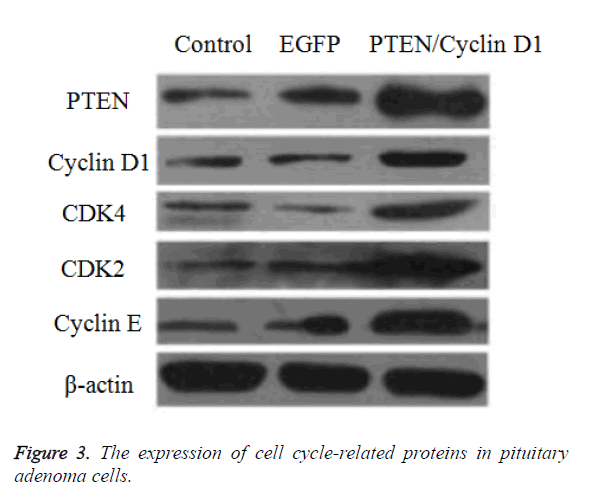 While compared with Ad EGFP group and the control group, cells of Ad PTEN/Cyclin D1 group of increasing expression have significantly enhanced proliferation, prompting that PTEN/Cyclin D1 can promote the proliferation of pituitary tumor cells as shown in Figure 1. Figure 1. Proliferation curve of pituitary tumor cell determined by MTT method. To further understand the effect of PTEN/Cyclin D1 molecules on the anchoring of pituitary tumor cells GH3, clone formation test is conducted in this study. As shown in Figure 2: the clone number of tumor cell infected with Ad-PTEN/Cyclin D1 obviously increases compared with that infected with empty virus Ad EGFP and that in control group. The result further shows: PTEN/Cyclin D1 can promote the ability of anchoring independent growth of the pituitary tumor cells in vitro and increase the growth capability of pituitary tumor cells. Figure 2. The effect of PTEN/Cyclin D1 on anchoring independent growth of the pituitary tumor cells. This study further analyses the mechanism of PTEN/Cyclin D1 for improving cell cycle progression of pituitary adenoma cells and Western blot results show: the expression of cell cycle-related protein CDK4, CDK2 and Cyclin E increases with the up-regulation of PTEN/Cyclin D1 and decreases with the down-regulation of PTEN/Cyclin D1 as shown in Figure 3. Figure 3. The expression of cell cycle-related proteins in pituitary adenoma cells. Pituitary adenoma becomes one of the most common malignant tumors in clinical endocrine system and is difficult to diagnose at the onset. The illness has often reached an advanced stage once diagnosed clinically and pathologically [11,12]. At present, the standard treatment of pituitary adenoma mainly is the ideal combination of cyto-reductive surgery with therapy of radiation and chemotherapy [13,14]. After years of exploration, the advanced microsurgical technique can maximize the removal of the tumor tissue, but the 5 y survival rate of pituitary adenoma patients remains only about 15% [15,16]. Patients after chemotherapy ends would frequently encounter chemotherapy failure caused by drug resistance and the other part of patients cannot bear the lethal effect of chemotherapy drugs. The tumor cells are killed together with non-tumor cells. Thus, to explore the occurrence mechanism of pituitary adenoma becomes the new hot spot . The results showed that PTEN/Cyclin D1 can promote pituitary tumor cell growth and proliferation under the main mechanism of the up-regulation of the cell cycle related proteins like CDK4, CDK2, and Cyclin E. As a newly discovered tumor suppressor gene, PTEN is different from the traditional apoptosis regulating molecule Bcl-2 family and Caspase family. It exists in the Ras signaling pathways as a key molecule. The expression of PTEN completely depends on the stimulation of growth factors like IL-3, stem cell factors, and TPO. From the point of view of biology, however, it performs specific function mainly through the interaction of protein molecules and involvement in signaling pathways. The results show that PTEN can promote pituitary tumor cell proliferation. Cyclin D1 is the protein encoded by human CCND1 gene (specific cyclin-D1). As a kind of traditional proto-oncogenes, the excessive expression of Cyclin D1 can turn the cells to malignant tumor with the cell proliferation out of control. As the regulatory proteins in G1/S phase of cell cycle, CDK4, CDK2 and Cyclin E play an important role in split and copy of both normal cells and malignant tumor cells . The upregulation of CDK4, CDK2 and Cyclin E promotes cell proliferation and advances the cell replication in G1 phase and mitosis in S phase while the down-regulation inhibits the cell proliferation, inducing a cell cycle arrest in G1 phase and damaging the reproduction capacity of cells. The experiment results show that the up-regulation of PTEN/Cyclin D1 can increase the expression of cell cycle- related protein molecules like CDK2, CDK4, and Cyclin E. This is consistent with other studies result that Cyclin D1 is a kind of important key molecules in cell cycle activity . PTEN enables to make negative regulation on the expression of p38MAPK while p38MAPK promotes the cell proliferation through the negative regulation of CyclinD1molecules. In addition, Cyclin D1 can also activate the transcription factors NF-κB, also prompting the Cyclin D1 promotes pituitary tumor cell proliferation and showing that PTEN/Cyclin D1 molecules’ role in promoting the proliferation process of pituitary tumor cells with its main influence in the level of gene transcription. Above all, PTEN/Cyclin D1 continues showing its function of promoting the tumor cell proliferation in vitro experiment of pituitary adenoma. In addition, PTEN/Cyclin D1 has no or weak signal of expression in normal pituitary tissues while turns out to be of high expression in pituitary tumor tissues, illustrating PTEN/Cyclin D1 has strong sensitivity and specificity in the diagnosis of pituitary adenoma and is expected to become the new target for pituitary adenoma diagnosis and treatment. The experiment verifies that PTEN/Cyclin D1 continues showing its function of promoting the tumor cell proliferation in vitro experiment of pituitary adenoma and comes into play through the expression of cell cycle-related protein molecules like CDK2, CDK4, and Cyclin E.
Siegel R, Ward E, Brawley O. Cancer statistics, 2011: the impact of eliminating socioeconomic and racial disparities on premature cancer deaths. CA Cancer J Clin 2011; 61: 212-236. Sheng Q, Liu J. The therapeutic potential of targeting the EGFR family in epithelial ovarian cancer. Br J Cancer 2011; 104: 1241-1245. Li B, Li Q H, Lin YN. Expression of CIAPIN1 gene in BMMNC of patients with leukemia. Zhongguo Shi Yan Xue Ye Xue Za Zhi 2011; 19: 570-573. Brewster WR, Cliby W. Summary of the 2011 Annual Meeting on Womens Cancers. Gynecol Oncol 2011; 122: 5-8. Banci L, Bertini I, Ciofi-Baffoni S. Anamorsin is a (2Fe-2S) cluster-containing substrate of the Mia40-dependent mitochondrial protein trapping machinery. Chem Biol 2011; 18: 794-804. Saito Y, Shibayama H, Tanaka H. PICOT is a molecule which binds to anamorsin. Biochem Biophys Res Commun 2011; 408: 329-333. Qu Y, Wang J, Ray P S. Thioredoxin-like 2 regulates human cancer cell growth and metastasis via redox homeostasis and NF-kappaB signaling. J Clin Invest 2011; 121: 212-225. Santini D, Schiavon G, Vincenzi B. Receptor activator of NF-kB (RANK) expression in primary tumors associates with bone metastasis occurrence in breast cancer patients. PLoS One 2011; 6: 19234. Akca H, Demiray A, Tokgun O. Invasiveness and anchorage independent growth ability augmented by PTEN inactivation through the PI3K/AKT/NF-kB pathway in lung cancer cells. Lung Cancer 2011; 73: 302-309. Nagendraprabhu P, Sudhandiran G. Astaxanthin inhibits tumor invasion by decreasing extracellular matrix production and induces apoptosis in experimental rat colon carcinogenesis by modulating the expressions of ERK-2, NF-kB and COX-2. Invest New Drugs 2011; 29: 207-224. Rahman M, Chan A P, Tai I T. A peptide of SPARC interferes with the interaction between caspase8 and Bcl2 to re-sensitize chemo-resistant tumors and enhance their regression in vivo. PLoS One 2011; 6: 26390. Saito Y, Shibayama H, Tanaka H. A cell-death-defying factor, anamorsin mediates cell growth through inactivation of PKC andp38MAPK. Biochem Biophys Res Commun 2011; 405: 303-307. Li H, Mapolelo D T, Dingra N N. Histidine 103 in Fra2 is aniron-sulfur cluster ligand in the (2Fe-2S) Fra2-Grx3 complex and is required for in vivo iron signaling in yeast. J Biol Chem 2011; 286: 867-876. Beatty GL, Chiorean EG, Fishman MP. CD40 agonists alter tumor stroma and show efficacy against pancreatic carcinoma in mice and humans. Science 2011; 331: 1612-1616. Mitic N, Milutinovic B, Jankovic M. Assessment of sialic acid diversity in cancer and non-cancer related CA125 antigen using sialic acid-binding Ig-like lectins (Siglecs). Dis Markers 2012; 32: 187-194. Hanahan D, Weinberg R A. Hallmarks of cancer: the next generation. Cell 2011; 144: 646-674. Wu Q, Gou Y, Wang Q. Downregulation of RPL6 by siRNA inhibits proliferation and cell cycle progression of human gastric cancer cell lines. PLoS One 2011; 6: 26401.